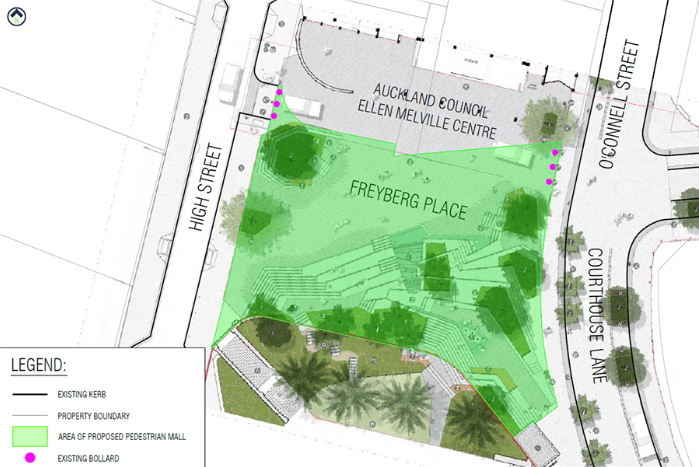 Some good news yesterday with Auckland Transport announcing that Freyberg Square will be changed to a pedestrian mall following their consultation a few months ago. It’s a simple but important change that will see the retractable bollards defaulted to being raised and to only lowered be lowered for emergencies or for a special exception. The square will become pedestrian only from 15 October. 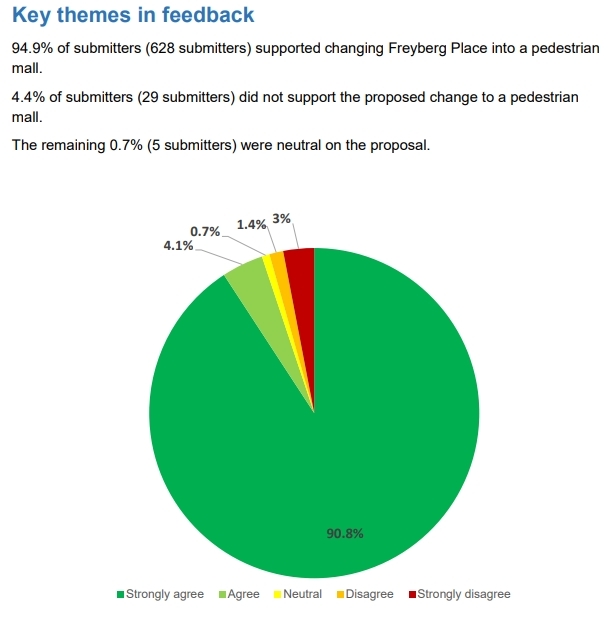 AT received 665 pieces of feedback for the proposal with 95% of respondents agreeing with it. The most common reasons for opposing the plan are the same age-old reasons, that people might have to drive around the block, past a carparking building that is not full, in the hope that during that time someone left to enable them to find a car park outside the door the visiting. It’s no surprise that 95% of the public overwhelmingly support this change. Back in 2015, prior to the upgrade, 84% of submitters supported the move but the council got cold feet after lobbying by a few vocal businesses (one of which has since moved). It’s a subtle but important shift to have unrestricted access for people at all times, but only allow vehicle access at specific times. Most of the local streets of the City Centre should be like this. O’Connell would be an obvious example. I have to admit I was wrong about Freyberg Place. I wondered what all the steps were for and doubted they would be used. But I have since seen them full of people sitting there, even in a howling gale when the sun wasn’t out. Clearly the world need more steps. Bless. Here’s a primer to get you started miffy. There is also a film. This guy has some interesting books. Great News! Crazy it took so long. Now for more of the city centre to get the same treatment. Excellent news, now for High St.
Freyberg Place is just one of those spaces that works, its always being used and enjoyed. Then you come spilling out onto High St, one of those places that just doesn’t work, it’s always busy but has to be endured. Freyberg Place once had shade trees…… …..Now it supports NZ biggest growth industry – Melanoma-…..why do we encourage young people to sun bathe on barren concrete steps.How can the designers of this square & a simliar one in Takapuna sleep at night – knowing that NZ is now leading the world with skin cancer. Same thing in my local square. Designers love to have a clean piece of paper. We also love to spend money on upgrades but not on maintenance. So whereas in places with pretty streetscapes and squares, there’s a budget to tidy up the leaves and seeds each day – or the retailers do it, knowing that the trees enhance the area and bring custom – we prefer to say “the trees leave a dangerous mess and so they must go” and the retailers push for this rather than take it on themselves. So, with this and O’Connell St done, what now with the pedestrianisation of High Street? Finally going to happen? If so, when? I was going to say that those in High St fighting pedestrianisation must be listening to this, but they may well have been part of the 29 who opposed. This is good news indeed – and I was one of the 95% who submitted who support the pedestrian mall. Pedestrianising High St is overdue. It gets phenomenal foot traffic as an alternative to Queen St for those going uptown or downtown. The footpaths are inadequate for this, with two people barely able to pass in some places. Pedestrians cross wherever they need to, including from between parked cars, because there is a lack of designated crossings. Peds who cross are forced to watch for cars because cars have right of way and don’t need to watch for them. With Queen St getting ever more crowded with slow-moving window shoppers, loiterers, and those infuriating people who trudge along oblivious to oncomers while staring down at their cellphone, it’s time to widen High St as a high speed alternative route. I agree, but disagree! High Street should indeed be widened and pedestrianized but for the complete opposite affect to making it a high speed alternative route. I’d actually prefer to slowly amble down High Street, dodging the cafe tables that could spill out onto the street. It should be Queen Street…or Albert Street that are the ‘fast lanes’ and these narrower places like Federal Street and High Street / Lorne Street should be our hospo and retail strips, for the smaller independent places, linking into Britomart. Look at Brighton’s (UK) “North Laine” for some inspiration for how a street like this can work. It’s a major pedestrian shopping destination, has no street parking, and is of similar size to High street. I loved it there. It could be like Pitt St Mall in Sydney….just with restaurants and bars as well. I don’t think there is currently an equivalent? The rebuild for High Street is budgeted for about 6 years away – it uses the central city targeted rate, so right now it’s not so much a matter of if, but when. Of course – in about 4 years they’ll start thinking about the best design etc. And in about 5 years some local business owners will make a load of noise and make sure that vehicle access is retained so that we spend a whole load of the streets budget for very little change. How is it that the retailers don’t realise most people walk to their shops? Because most of the same drive to malls and supermarkets. They probably also drive to their shops. For them, to drive is normal. The concept of people walking to their premises is alien to them. It’s hard to identify in yourself any form of bias, this being another example. Heck, even if the council were to send all the retailers in High St the results of a survey showing that most customers walked from PT/work, the results would be so alien that the retailers would reject the results – They “have to be wrong, this is garbage”, etc. Yes, I was hearing from a local board member that as the board sat and looked at the local cycleway numbers, which were impressive, one member said “But people don’t use cycleways.” The numbers were sitting in front of him, but that didn’t change his view. I know a former cycle mechanic who holds the exact same view of cycleways and buses. For both he responds that the numbers must be wrong and challenges me by saying if people used buses, he wouldn’t see endless empty buses pass by his business. Of course attempts to explain that some buses would be at the start/finish of their route, or heading to/from their first/last stop fails to have any impact, even though he knows that the depot is close to his business. It’s not even worth mentioning confirmation bias. Why on earth can’t AC just do a trial. Block off the Shortland street entry with a few planters for a weekend and set up a street market. Make it happen every weekend, then eventually more often. Exactly. Just because the street makeover is not for another 6 years doesn’t mean the traffic has to stay for that long. Indeed. And numbers of people enjoying the area and retailer takings, etc, could be tracked again. It would be really useful research into how much of the improved use of the area is due to the expensive treatments, and how much is just due to stopping traffic, and perhaps allowing a few low-cost improvements (seats, tables, planters). Indeed, don’t we need this research? It could support the roll-out of low-cost pedestrianisation across the city. It’s now time to move on from individual street treatments and develop and proceed with an integrated plan for humanising the whole Queen St valley. The case for this is proved by the spectacular success of the recent upgrades and vehicle reduction. Now let’s join these up into a coherent single system, accomodating pedestrians, bikes, light rail and buses, and delivery, service, and emergency access. And great design. Including the options of quick and/or temporary changes. It could maybe do with a metro-style walking map, like the one in this article? Interesting article. “Withholding planning permission for big shopping centres has meant that small businesses – which elsewhere have been unable to withstand Spain’s prolonged economic crisis – have managed to stay afloat.” I was going to reply to Patrick’s comment that the next step should really be bringing these place concepts to the suburbs better. Now I’m just feeling that we’ve sealed the fate of our car dependent suburbs – I’ll never understand why Council allows the mega malls, and it’s just getting worse. Generally, I understand that the out-of-town shopping malls and mega-stores play off one town against another, threatening to go to the neighbouring town if they don’t get their permissions and deals, so that the town without the mall feels the impacts as business is sucked away from its independent high-street stores, but doesn’t get the meagre benefits (tax revenues, poorly-paid jobs… can’t think of any others???). But I really don’t know why a city like Auckland should be susceptible to such manipulation. Are these planning decisions parochially-made, even in the super-city? Or just poorly-made, centrally? Another recent walkable city article in the Guardian. Auckland gets a mention. I think first we will be what I call a ‘mullet city’; one head two haircuts. Walkable in parts, and only drivable in others. That I’m confident is certain, what is not yet certain is whether the value of walkability can/will be spread across the wider region…..? But certainly at the big Centre, then the secondary ones. And when they are all interconnected by great Rapid Transit too, the swamps of autodependency wont matter so much. Both conditions will be largely optional… people will be able to choose, unlike now. Since no more cars, there is now a space we can utilize. Also some food containers similar to those at Elliott street would be nice. Has there been an evaluation of the upgrades in the area similar to the Fort St Evaluation Report? I’m thinking of something that shows the retailers’ changed perceptions, traffic and pedestrian movement figures, retailer takings, and satisfaction levels of residents and visitors. I am glad they published the response figures. It shows what a tiny, noisy minority (often a vested interest) that those wanting car access everywhere, turn out to be. Great news! Full support for this from members of Ellen Melville’s family. How does the emergency access work, anyone know? I ask because it could be useful elsewhere if it’s a robust system. Do you know how is that triggered? Old fashioned key or combination or higher tech than that? Bully Boy Bollards so it can be done by a key on-site or remotely. But probably won’t be needed as emergency services more likely to use other routes.